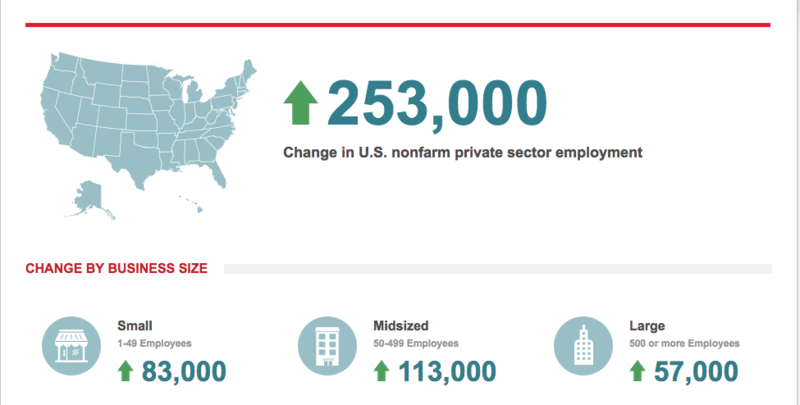 Private-sector employment increased by 253,000 from April to May, on a seasonally adjusted basis. 30-year fixed-rate mortgage (FRM) averaged 3.94 percent with an average 0.5 point for the week ending June 1, 2017, down from last week when it averaged 3.95 percent. A year ago at this time, the 30-year FRM averaged 3.66 percent. 15-year FRM this week averaged 3.19 percent with an average 0.5 point, the same as last week. A year ago at this time, the 15-year FRM averaged 2.92 percent. 5-year Treasury-indexed hybrid adjustable-rate mortgage (ARM) averaged 3.11 percent this week with an average 0.5 point, up from last week when it averaged 3.07 percent. A year ago at this time, the 5-year ARM averaged 2.88 percent. Inventory is down 9.0 percent from a year ago, causing a constraint on buyer demand. April’s PHSI, which is based on contract signings, dipped to 109.8, a 1.3 percentage point drop from March’s downwardly revised 111.3. Northeast: PHSI declined 1.7 percent to 97.2 in April, 0.6 percent below a year ago. Midwest: PHSI declined 4.7 percent to 104.4 in April, 6.1 percent lower than April 2016. South: PHSI declined 2.7 percent to 125.9 in April, down 2.3 percent year over year. 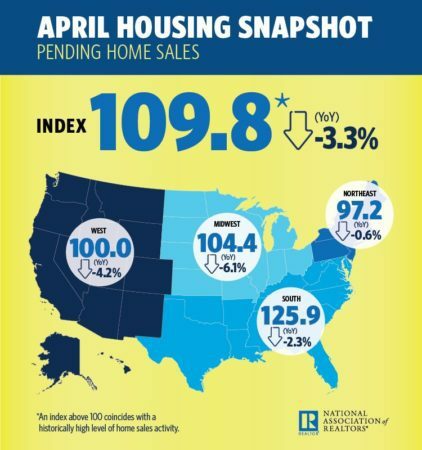 West: PHSI increased 5.8 percent in April to 100.0, 4.2 percent lower than the same time last year. 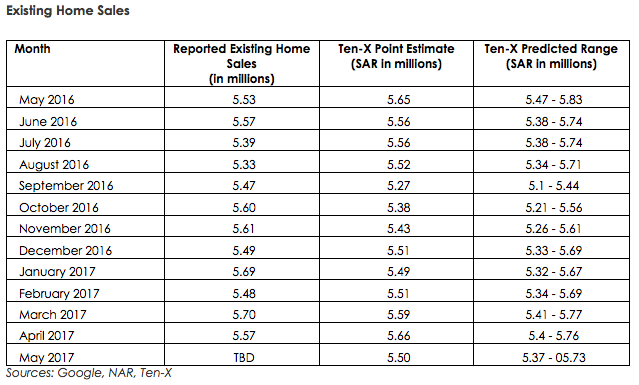 Ten-X Residential Real Estate Nowcast indicates a slight decrease in May existing home sales. The nowcast projects May sales will hit a seasonally adjusted annual rate (SAAR) between 5.37 and 5.73 million with a targeted number of 5.50 million, down 1.2 percent from NAR’s reported April sales and down .54 percent from a year ago. Mortgage applications decreased 3.4 percent from one week earlier. 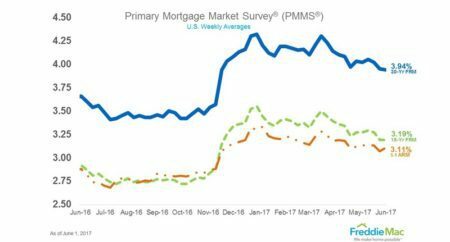 The refinance share of mortgage activity decreased to 43.2 percent of total applications from 43.9 percent the previous week. The adjustable-rate mortgage (ARM) share of activity decreased to 7.7 percent of total applications. The FHA share of total applications decreased to 10.5 percent from 10.8 percent the week prior. The VA share of total applications increased to 10.8 percent from 10.5 percent the week prior. The USDA share of total applications remained unchanged at 0.8 percent from the week prior. The average contract interest rate for 30-year fixed-rate mortgages with conforming loan balances and with jumbo loan balances remained unchanged. The average contract interest rate for 15-year fixed-rate mortgages decreased to 3.42 percent from 3.45 percent. Home prices have continued to rise across the country in the last 12 months. March saw a 5.8 percent annual gain, which set a 33-month high. Seattle, Portland, and Dallas reported the highest year-over-year gains. Seattle led the way with a 12.3 percent year-over-year price increase, followed by Portland with 9.2 percent, and Dallas with an 8.6 percentincrease. 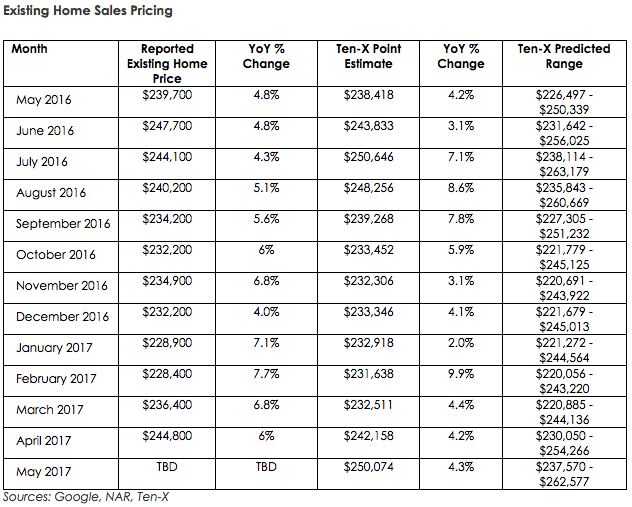 Ten cities reported higher price increases in the year ending March 2017 than in the year ending February 2017. “Home prices continue rising with the S&P Corelogic Case -Shiller National Index up 5.8 percent in the year ended March, the fastest pace in almost three years,” says David M. Blitzer, Managing Director and Chairman of the Index Committee at S&P Dow Jones Indices. The national Home Price Index (HPI) hit another peak in March 2017, continuing the upward trend and marking a 2.3 percent gain in home prices in 2017. San Francisco, Seattle, and San Jose, Calif., have seen metropolitan home prices rise by at least 5 percent since January 2017. Prices fell another 4.5 percent in Tuscaloosa, Ala., which marks a 17 percent decline year-to-date. The top 5 movers at the state level in March included: Washington (2.2 percent), Nebraska (1.9 percent), Michigan (1.7), Oregon (1.7 percent), and Georgia (1.7 percent). The top 5 movers at the metro level in March included: San Jose, Calif., (2.6 percent), Seattle, Wash., (2.4 percent), Bellingham, Wash., (2.3 percent), Walla Walla, Wash., (2.2 percent), and San Francisco, Calif., (2.2 percent). The Index has been steadily decreasing from January to March, then picking up in April, showing strong variability in 2017. Buyers requesting tours was up 12.1 percent in April, compared to March, and buyers writing offers was up to 6.9 percent.